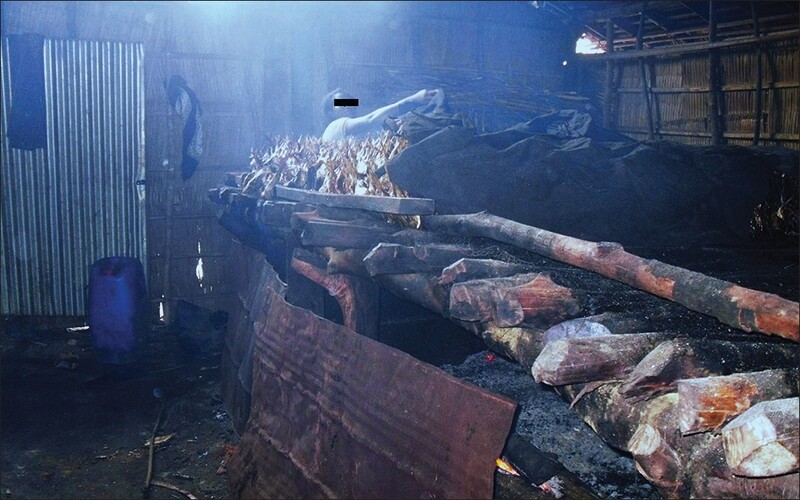 Background: Burning of biomass is widely used by the rural poor for energy generation. Long term exposure to biomass smoke is believed to affect lung function and cause respiratory symptoms. 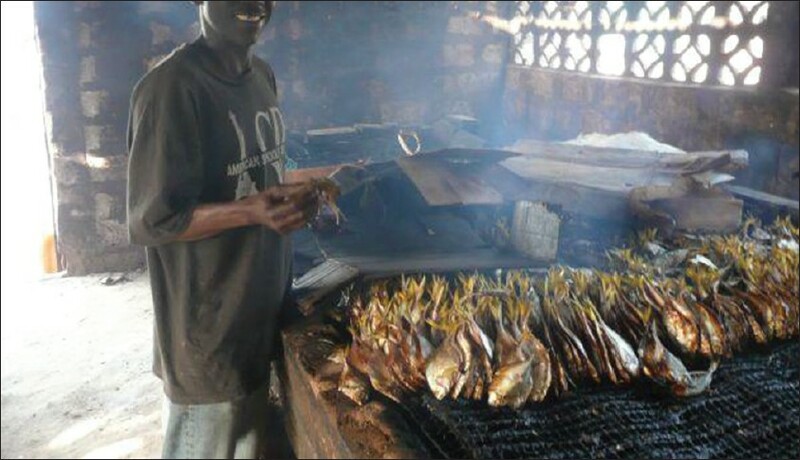 Materials and Methods: Women with long term occupational exposure to burning firewood were recruited from a rural fishing community in Nigeria. A questionnaire was used to obtain information on symptoms of chronic bronchitis and spirometery was performed to measure lung function. Data obtained from the subjects was compared with that from healthy controls. Results: Six hundred and eighty six women were recruited for this study made up of 342 subjects and 346 controls. Sixty eight (19.9%) of the subjects had chronic bronchitis compared with eight (2.3%) of the controls (χ2 = 54.0, P < 0.001). The subjects had lower values for the lung function as well as the percentage predicted values (P < 0.05). Fish smoking and chronic bronchitis were significantly associated with predicted lung volumes. Conclusion: Chronic exposure to biomass smoke is associated with chronic bronchitis and reduced lung functions in women engaged in fish smoking. Background and Objectives: Tuberculosis (TB) is an important cause of childhood morbidity and mortality with different clinical presentations and outcomes as compared to TB in adults. The present study was designed to compare these differences and to determine if childhood TB was an important predictor of adverse outcome following treatment under the Revised National Tuberculosis Control Program (RNTCP). Materials and Methods: Retrospective record based study of cases registered between January 2008 and December 2011, at the Amdanga TB Unit (TU), West Bengal. Results: Of the total 1,508 cases notified, 3.4% were childhood TB. Differences with adult TB were noted in the number of cases categorized as cat II and III in children (P = 0.012 and 0.000, respectively). New smear positive pulmonary TB was significantly lower (21.6%, P = 0.000), while new extra-pulmonary TB (39.2%, P = 0.000) was significantly higher in children. Smear negative cases comprised 7.8 and 11.4% of the childhood and adult cases of TB, respectively. Retreatment cases were significantly higher in adults (P = 0.012). Among the registered new smear positive cases, the differences in favourable and adverse outcomes did not have a significant statistical difference (P = .100) . Childhood TB was not a significant risk factor for adverse outcome following treatment (adjusted odds ratio [AOR] = 0.80, 95% confidence interval [CI] = 0.28-2.32). Conclusions: The registration of childhood TB under the RNTCP in the TU was low. There were differences in the clinical presentation and treatment outcomes of TB among children and adults. Childhood TB was not a significant predictor of adverse treatment following treatment. Background and Objective: Obesity and asthma are common inflammatory conditions, having presence of both local and systemic inflammation and this relationship is not well understood. This study was undertaken to compare pulmonary function parameters, inflammatory marker like C-reactive protein (hs-CRP), exhaled nitric oxide (FE NO ) and atopic profile between non-obese and obese bronchial asthma patients in Indian population. The study aims to elucidate the association between the systemic and local inflammatory response relating to obesity in asthmatics. Materials and Methods: Sixty bronchial asthma patients were recruited for the study, and were divided equally into obese (BMI>30 kg/m 2 ) and non-obese (BMI<25 kg/m 2 ) groups. These were assessed for pulmonary function parameters, blood hs-CRP levels, exhaled breath analysis of nitric oxide and skin prick testing for atopic profile. The study was approved by institutional ethical committee. Results: The mean body mass index (BMI) for the non-obese and obese group was 21.64 kg/m 2 and 34.1 kg/m 2 respectively (P = 0.001). The functional residual capacity (FRC% predicted) (100.9 ± 4.21 vs 80.40 ± 4.03; P = 0.009) and expiratory reserve volume (ERV% predicted) (95.13 ± 6.71 vs. 67.03 ± 4.54; P = 0.001) both were significantly lower in the obese group. The non-obese and obese group had hs-CRP levels of 3.01 mg/L and 4.07 mg/L, respectively; the difference being statistically insignificant (P = 0.15). Similarly, FE NO levels of non-obese and obese group were 63.20 ppb and 63.75 ppb, respectively; difference was not statistically significant (P = 0.95). Atopic profile of both the groups did not differ significantly. 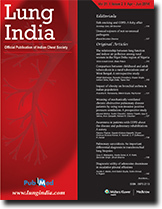 Conclusion : Obesity does not appear to increase the local and systemic inflammatory responses in bronchial asthma patients in Indian population. Background: Chronic obstructive pulmonary disease (COPD) patients frequently pose difficulty in weaning from invasive mechanical ventilation (MV). Prolonged invasive ventilation brings along various complications. Non-invasive positive pressure ventilation (NIPPV) is proposed to be a useful weaning modality in such cases. Objective: To evaluate the usefulness of NIPPV in weaning COPD patients from invasive MV, and compare it with weaning by conventional pressure support ventilation (PSV). 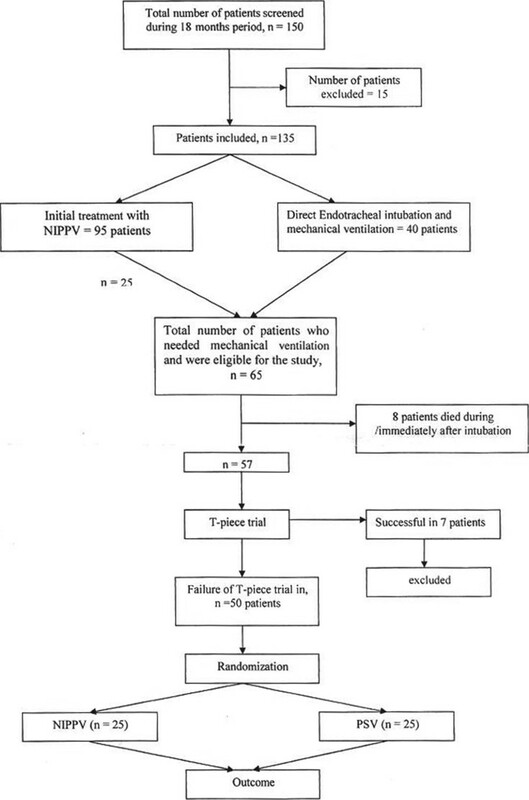 Materials and Methods: For this prospective randomized controlled study, we included 50 COPD patients with type II respiratory failure requiring initial invasive MV. Upon satisfying weaning criteria and failing a t-piece weaning trial, they were randomized into two groups: Group I (25 patients) weaned by NIPPV, and group II (25 patients) weaned by conventional PSV. The groups were similar in terms of disease severity, demographic, clinical and biochemical parameters. They were compared in terms of duration of MV, weaning duration, length of intensive care unit (ICU) stay, occurrence of nosocomial pneumonia and outcome. Results: Statistically significant difference was found between the two groups in terms of duration of MV, weaning duration, length of ICU stay, occurrence of nosocomial pneumonia and outcome. Conclusion: NIPPV appears to be a promising weaning modality for mechanically ventilated COPD patients and should be tried in resource-limited settings especially in developing countries. Background and Objective: Chronic obstructive pulmonary disease (COPD) is the fourth leading cause of death worldwide. It overloads the healthcare system and increase healthcare expenditure. As a patient's awareness enables him/her to acquire better self-management skills, it helps to reduce the severity and frequency of exacerbations, prevents hospitalizations, and improves health-related quality of life. 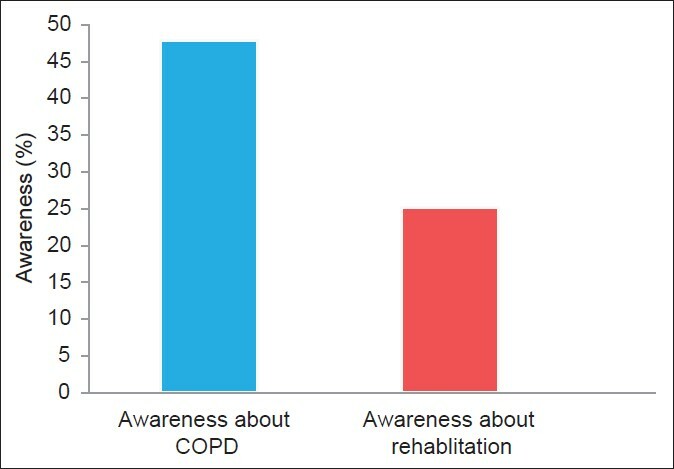 The current study aims to assess the awareness amongst COPD patients about the disease itself and pulmonary rehabilitation. Materials and Methods: A cross-sectional survey was carried out in order to evaluate awareness through "a COPD awareness questionnaire". This was developed and validated for its content. A total of 21 questions were included in this questionnaire. These questions were divided into two domains that included pulmonary disease (1-12) and pulmonary rehabilitation (13-21). Results: Three hundred patients were recruited of which 282 were included in the study. The subject group consisted of 177 males and 105 females. The mean age of the subjects was 63.54 ± 10.656. Awareness in the "disease domain" was 47.84% and "pulmonary rehabilitation domain" was 25.14%. Awareness about the causes of COPD was 34.8%, of common symptoms was 83.0%, and of activities of daily living that could increase breathlessness was found to be 73.8%. The need to consult a physiotherapist was reported by only 26.2%. 81.2% of the subjects believed that breathing exercise could cause breathlessness; whereas, only 19.5% were aware of secretion removal techniques. Conclusion: The findings of the study suggest an imminent need to educate the public about the disease and the scope of pulmonary rehabilitation and its role in the management of COPD. The education of patients in this regard needs to be incorporated into standard health care practice in order to improve their self-management skills and their quality of life. Background: Sarcoidosis is a systemic granulomatous disease of unknown etiology. Lungs and lymphatics are the principal sites affected by this disease. The disorder is often not suspected by physicians. 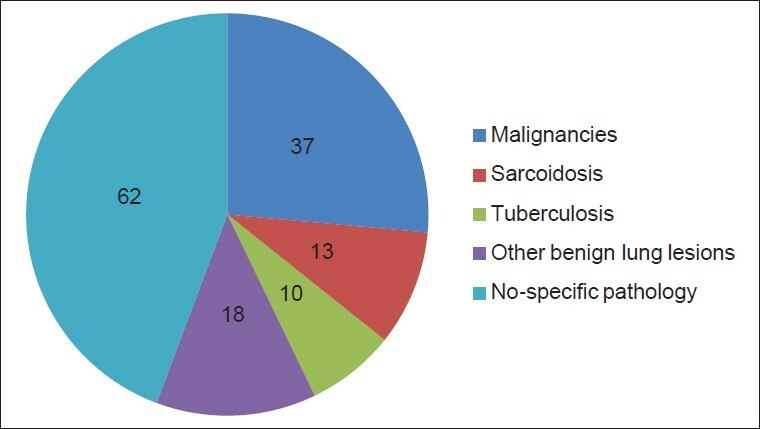 Materials and Methods: This was a retrospective study done on 140 transbronchial lung biopsies received for histopathological examination in the Department of Pathology for 1 year in a multispeciality tertiary care hospital, in Delhi. Results: Out of 140 transbronchial lung biopsies studied, 13 cases of sarcoidosis were diagnosed histopathologically. In these patients a clinical, pathological, and radiological corelation was done. And a final diagnosis of sarcoidosis was given after excluding other granulomatous lesions. Conclusion: Transbronchial lung biopsies have become an important tool in the diagnosis of sarcoidosis in present time. Hence sarcoidosis should be considered as a differential diagnosis when dealing with granulomatous lesions in lung biopsies. Objective: To determine the diagnostic utility of adenosine deaminase (ADA) in exudative pleural effusions of different etiologies. Setting and Design: It was an observational study conducted at a tertiary care teaching institute. Materials and Methods: Of a total of 171 pleural fluid samples, 122 were found to be exudates and were included in the study. Pleural fluid ADA was done for all included patients. 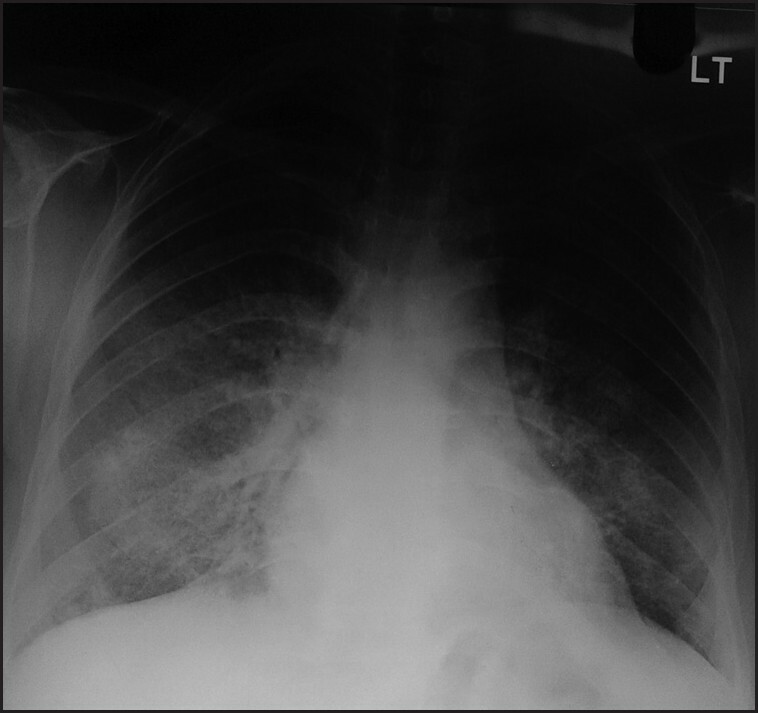 Pleural fluid ADA ≥40 U/l was taken as diagnostic cut off for TB effusion. 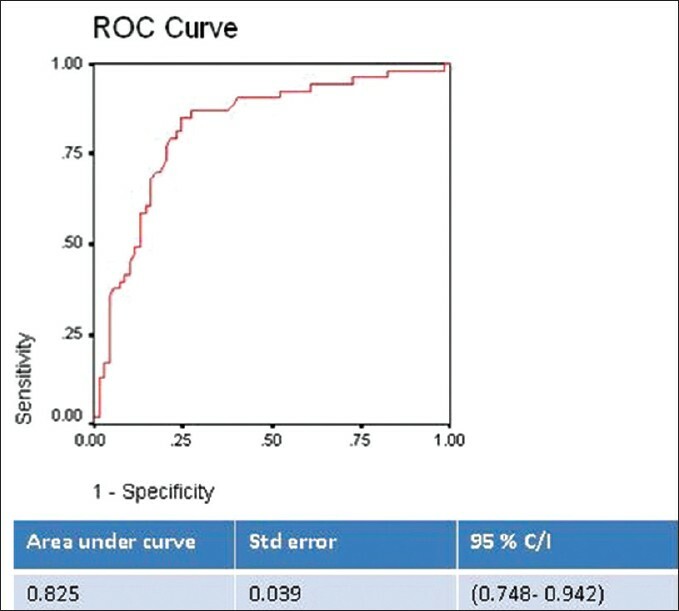 Statistical Analysis: Sensitivity, specificity positive and negative predictive value of pleural fluid ADA for diagnosing TB was calculated by using clinical calculator - 1, Richard Lowry 2001-2013. Results: There were 171 patients with pleural effusion, out of which 122 (71.8%) were found to be exudative and were studied further. There were 49 (40.1%), 36 (29.5%) and 33 (27%) cases of TB, malignancy and para pneumonic effusion respectively, whereas 4 (3.3%) cases remained undiagnosed. 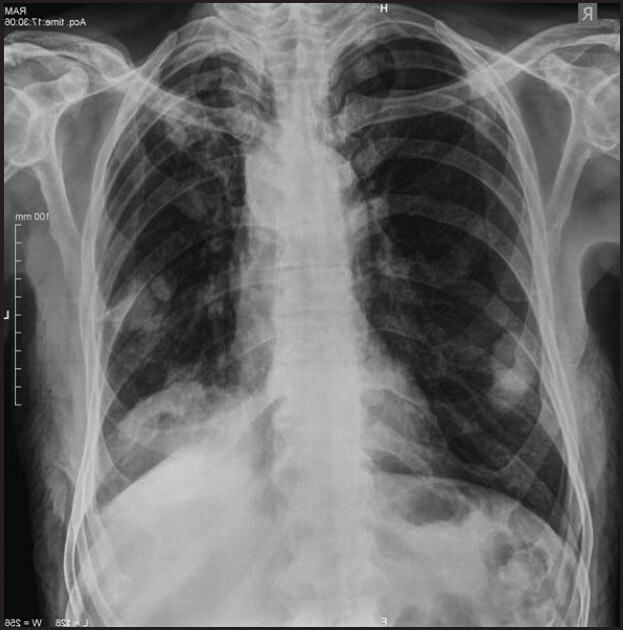 Median ADA values for TB, malignancy and para pneumonic effusion were 55.8 U/l (range 9.7-756 U/l), 18 U/l (6.5-81 U/l) and 25 U/l (3.4-172 U/l) respectively. Pleural fluid ADA >40U/l yielded 85.7% sensitivity, 80.8% specificity, 75% positive predictive value and 89.5% negative predictive value. Conclusion: Pleural fluid ADA remains useful in diagnosing tuberculosis pleural effusion. The median ADA for TB effusion in present cohort was 51.8 IU/ml. Pleural fluid ADA of 40 U/L yielded 89.5% negative predictive value and 75% positive predictive value. Pleural fluid ADA is cost effective and good screening test for diagnosis of TB. Marijuana (Cannabis sativa) has been used for recreational and medical purposes since ages. Marijuana smoking is an evil, which is on the rise with about 180.6 million active users worldwide. The recent legalization of marijuana in Uruguay has generated global interest. The purpose of this short review is to describe the various preparations, uses and adverse effects of medical marijuana. It also deals with the adverse effects of marijuana smoking when used for recreational purposes. ased on the current literature, medical use of marijuana is justified in certain conditions as an alternative therapy. Human immunodeficiency virus (HIV) disease is widespread all over the world, and the neurological and respiratory complications have been described previously. Peripheral neuropathy is one of the commonest neurological complications of the HIV infection. In this report we describe a HIV positive male smoker who was admitted to the hospital because of community acquired pneumonia. 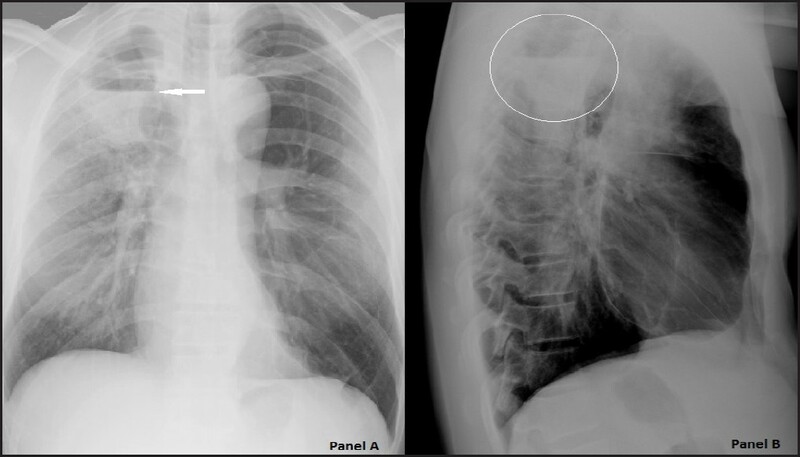 Bilateral diaphragmatic paralysis was diagnosed for which no other cause was found and was attributed to the HIV infection. Isolated phrenic neuropathy and diaphragmatic paralysis in an HIV positive patient is extremely rare and only a single such association has been described previously. Cryptococcosis is a systemic fungal infection associated with significant morbidity and mortality. It predominantly affects people with immunosuppresion and human immunodeficiency virus infection. Extrapulmonary dissemination is rare in immunocompetent hosts. 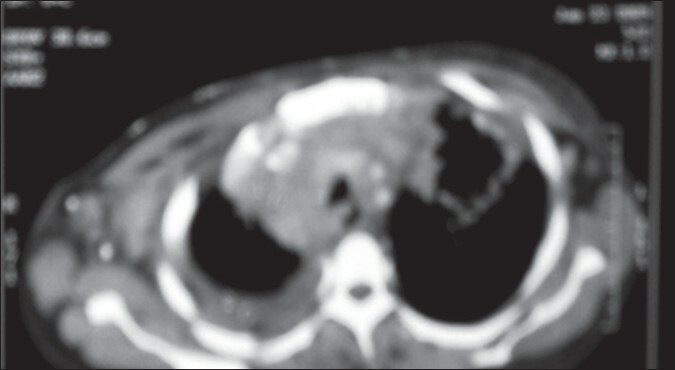 We present here a case of disseminated cryptococcosis in an immunocompetent patient who presented with an unusually large pulmonary mass and meningitis and successfully managed with medical therapy. 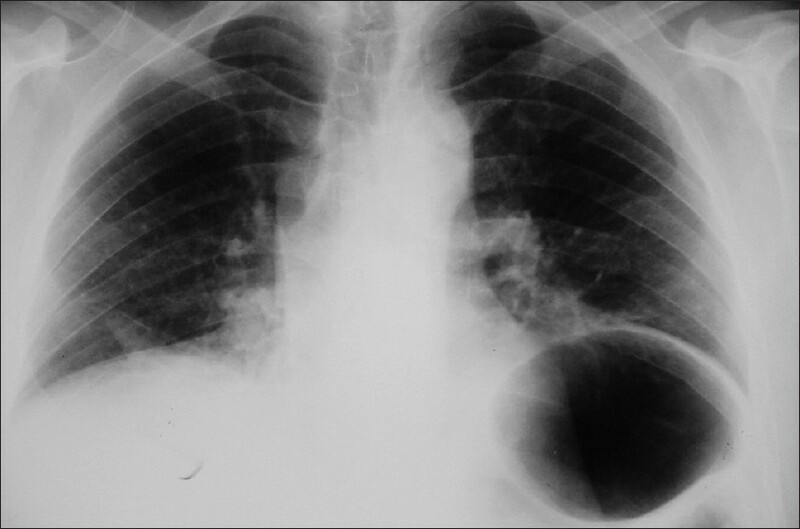 Pleural Aspergillosis is a rare entity, with most of the cases occurring on a background of lung disease or surgery. 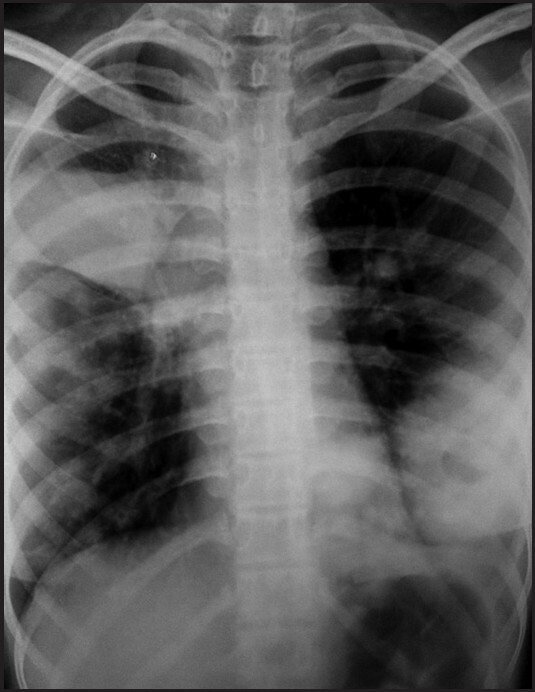 We report a case of a 16-year-old boy who developed pleural Aspergillosis in the absence of any obvious pre-disposing factors. 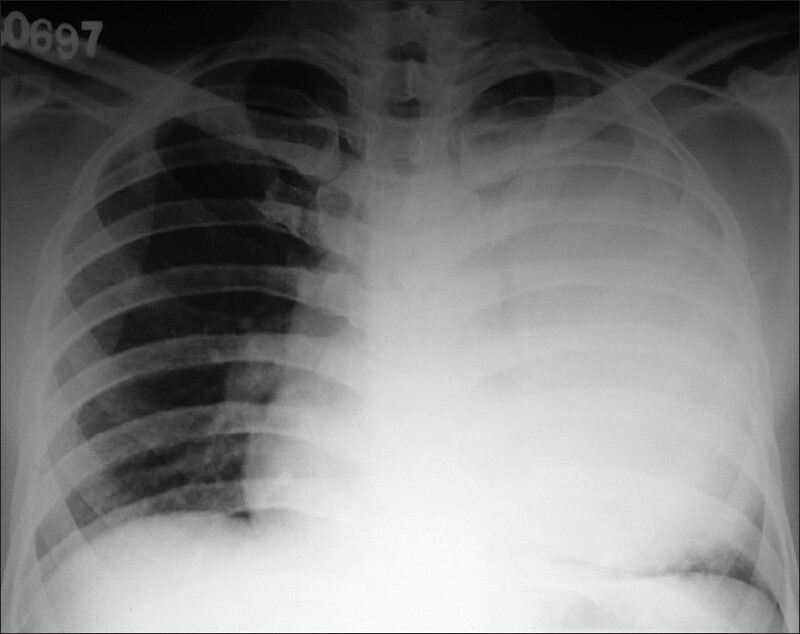 Patient presented with fever, dry cough and left sided chest discomfort of 6 weeks duration. 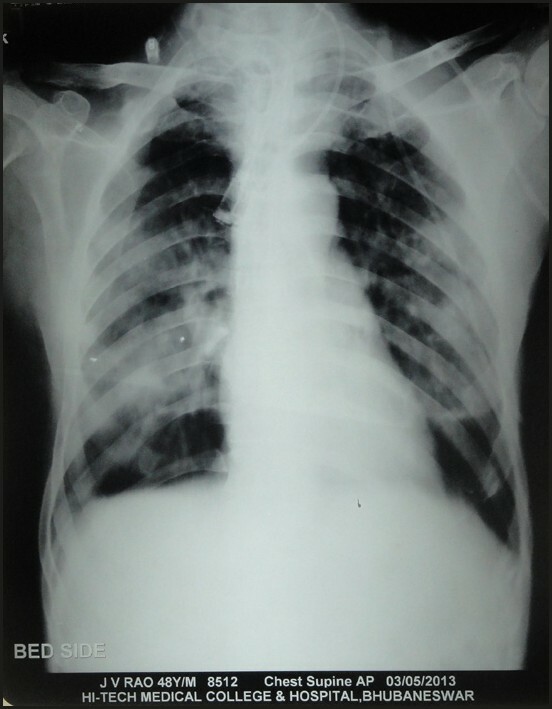 A chest radiograph revealed features of the left pyopneumothorax. Despite being started on presumptive antituberculous treatment and intercostal drainage his symptoms failed to resolve. The sputum and pus were then subjected to fungal smears and culture, which indicated growth of Aspergillus fumigatus. 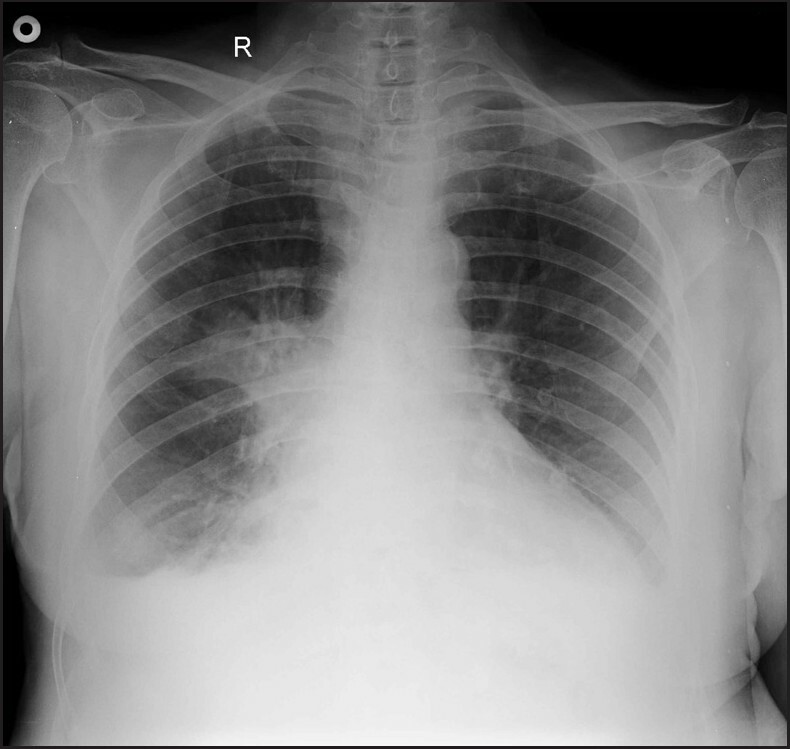 We report this case in view of the extreme rarity of pleural Aspergillosis occurring in a young healthy individual with no evidence of prior lung pathology. Furthermore, the source of infection was traced back to a very unusual possible focus - a decayed tooth infected with A. fumigatus, thus making the case even more interesting. Stereotactic body radiation therapy (SBRT) is a novel form of external beam radiation therapy. It is used to treat early and locally recurrent nonsmall cell lung cancer (NSLC) in medically inoperable patients. It uses high dose, hypofractionated radiotherapy, with targeting of the tumor by precise spatial localization, thus minimizing injury to surrounding tissues. It can be safely used to ablate NSLC in both central and peripheral locations. 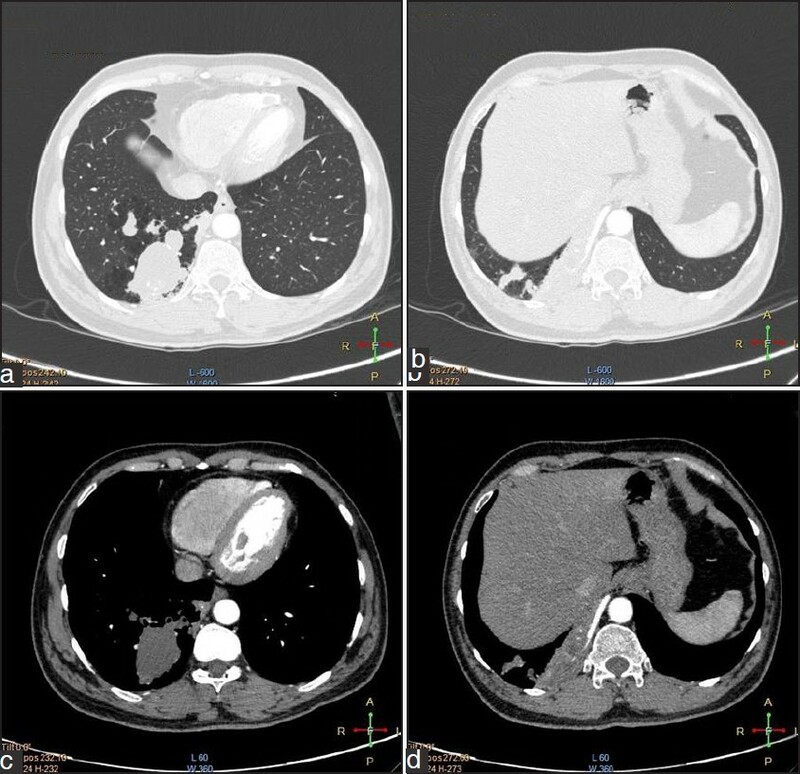 We present two cases of delayed esophageal perforation after SBRT for locally recurrent central NSLC. The perforations occurred several months after the therapy. 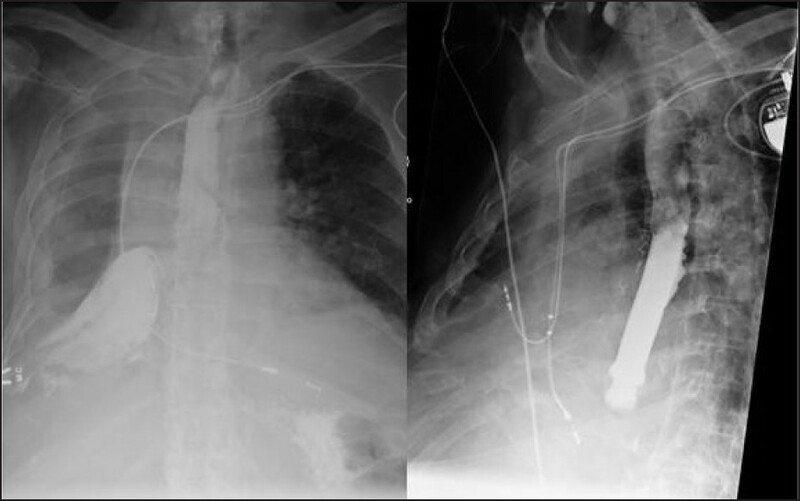 They were treated with covered esophageal stents, with mortality, due to the perforation in one of the patients. SBRT should be judiciously used to ablate centrally located NSLC and patients who develop episodes of esophagitis during or after SBRT, need to be closely followed with endoscopy to look for esophageal ulcerations. These ulcers should be closely followed for healing as these may degenerate into full thickness perforations several months after SBRT. S. stercoralis infection is very common in South East Asian countries including India. Chronic infection is very common with symptoms of diarrhea, abdominal pain, nausea, vomiting, anemia, and cough. Hyperinfection and dissemination usually occur in immunocompromised patients with symptoms mimicking asthma, COPD, or aseptic meningitis. Very few cases of hyperinfection and dissemination have been documented in immunocompetent patients. We report this case for its rarity and future references. 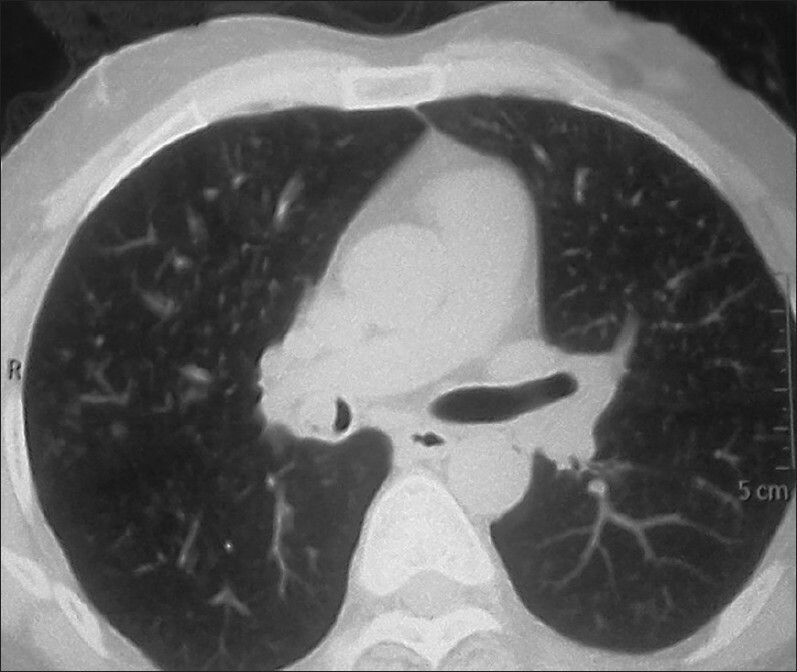 Pulmonary carcinosarcoma is a rare lung tumor, which contains both malignant carcinomatous and heterotopic sarcomatous components. 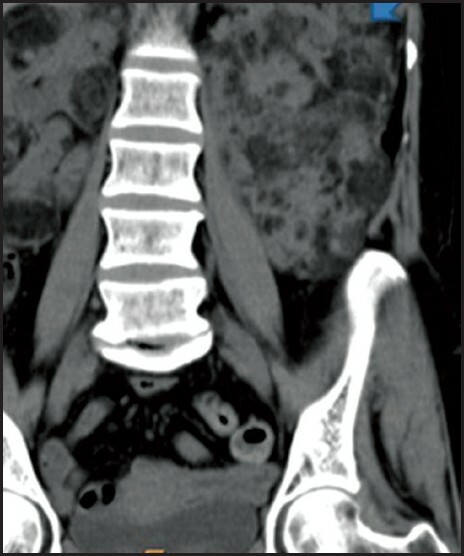 There are only few case reports on the imaging diagnosis of this rare tumor. Herein, we present the radiological findings of this rare tumor, which was suspected on computed tomography (CT) scan due to atypical CT findings of malignant lung mass (not usually seen in bronchogenic carcinoma) and was finally confirmed histologically. 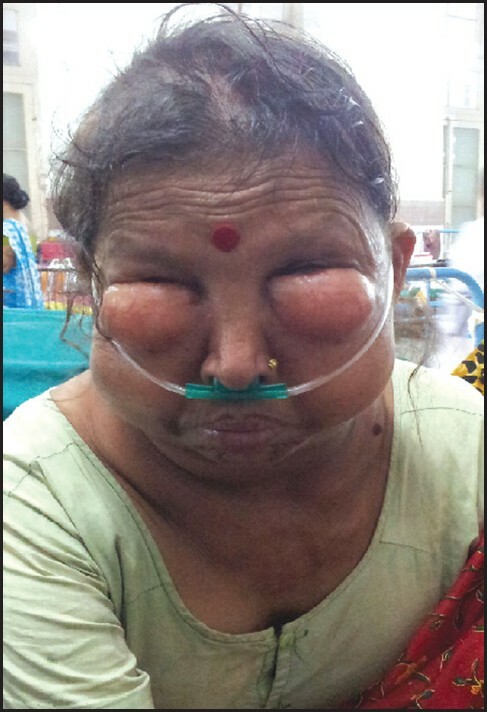 We present a 70-year-old female patient who had the history of hypertension and presented with massive haemoptysis. She had been complaining of cough with expectoration and mild streaking of blood in sputum for about 3 days with only crepts in right infrascapular and infra-axillary regions as positive clinical findings. Bronchoscopy revealed a cauliflower-like lesion in the upper- right lobe bronchus; bronchial aspirate showed occasional colonies of gram positive filamentous bacteria surrounded by neutrophils. The Trucut biopsy showed sheets of neutrophils with colonies of filamentous bacteria consistent with actinomycotic infection. She was started on intravenous benzyl penicillin 20 million units 6 hourly. She recovered with no further bouts of hemoptysis and was discharged on amoxicillin + clavulanic acid in a stable condition and she remained under similar condition for more than a year on follow up. Actinomycosis is a rare disease caused by a harmless commensal species, Actinomyces. Diagnosis of actinomycosis is a challenging situation, and more so, very few cases causing hemoptysis have come to light so far. Inflammatory myofibroblastic tumour (IMT) is a rare tumour affecting the tracheo-bronchial tree in the adult population. The clinical presentation of this tumour is diverse and diagnosis can be definitively clinched by histopathological examination. Treatment of this tumour usually requires surgical resection with bronchoscopic resection being described in few cases. 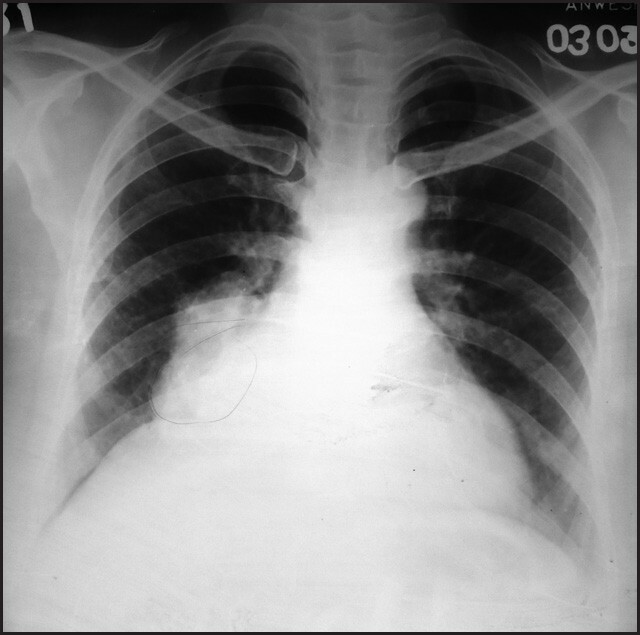 We describe a 32 year old male presenting with hemoptysis who was diagnosed to have IMT. 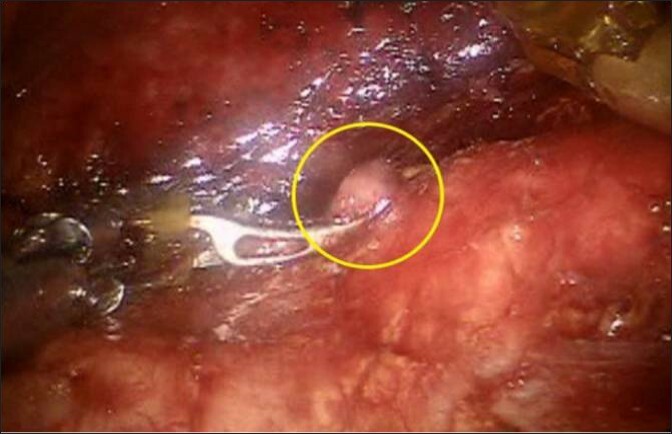 Resection of the tumour was done with the help of rigid bronchoscopy. Post-resection, hemoptysis stopped and no recurrence of tumour was noted on subsequent follow-up. We also present a systematic review of literature of all the cases of tracheo-bronchial IMT treated with bronchoscopic resection and conclude it to be a useful alternative to surgery in such cases. Vasculitis of medium- and large-sized arteries is an inflammatory and stenotic disease characterized by a strong predilection for the aortic arch and its branches. It presents with symptoms and signs as per the vessels and organs involved. Pulmonary sequestration is a rare abnormality characterized by a mass of nonfunctioning lung tissue that receives its vascular supply from a systemic artery and is separated from the normal tracheobronchial tree. 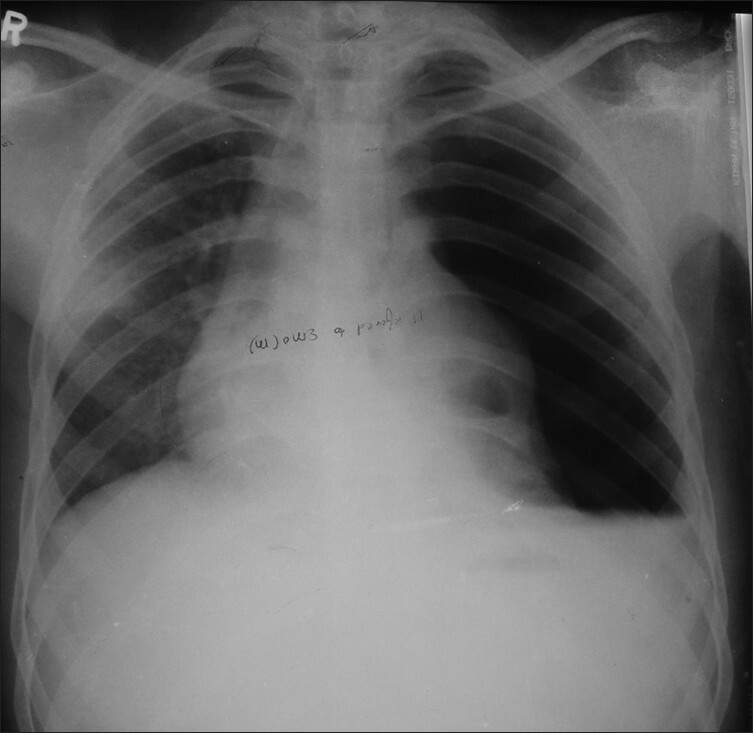 The following is a rare case report showing the presence of pulmonary sequestration in a patient with recently diagnosed hypertension and intestinal angina due to medium and large vessel vasculitis.